We live in a gig-based sharing economy. We share rides via Uber and Lyft, homes via Airbnb. We even have our groceries delivered by everyday people driving everyday cars. But while everyone is fixated on the Ubers of the world, few are paying attention to the ways in which Amazon is tinkering with this transformational service model and applying it to fulfillment, delivery and more. Read on to learn more about each of these—and why FBA Onsite may be the most innovative of them yet. 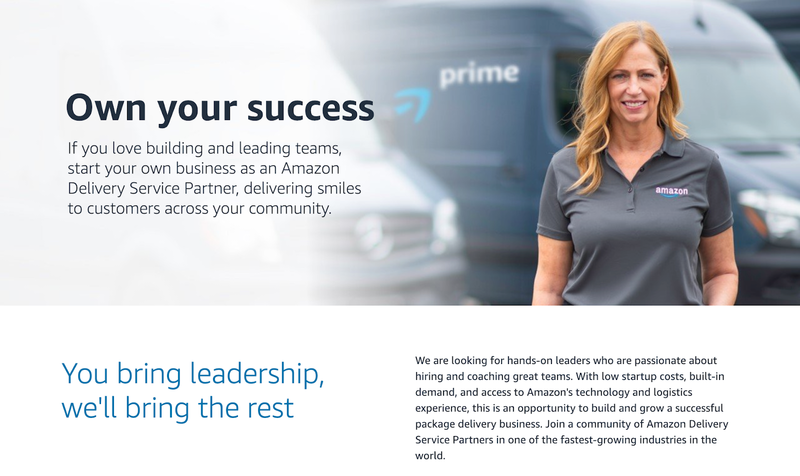 Amazon’s last mile delivery service, Amazon Logistics, is powered by a growing number of independent contractors or “Delivery Service Partners.” It’s intended to complement official providers (UPS, USPS and FedEx) by employing everyday drivers, walkers, cyclists, and other motorists to achieve 7-day or same-day delivery. Partners can help themselves to Amazon’s delivery technology and vehicles while observing certain stipulations and leasing fees, though they are not Amazon employees. For a $10,000 startup cost, they can build a small business of up to 40 delivery vehicles. Amazon Shipping now offers its marketplace sellers the ability to ship orders via Amazon Logistics instead of UPS, FedEx or USPS. The rates for this service, which include parcel pickup from the seller’s warehouse, are rumored to be as much as 10% lower than the rates that UPS and FedEx offer small- and medium-sized merchants. Amazon Shipping is now being rolled out in cities beyond Los Angeles and London, according to the Wall Street Journal. It’s safe to assume that Amazon will expand this offering to merchant shipments beyond its third-party marketplace. And you can bet that Delivery Service Partners will play a major role in supporting the execution of Amazon Shipping. 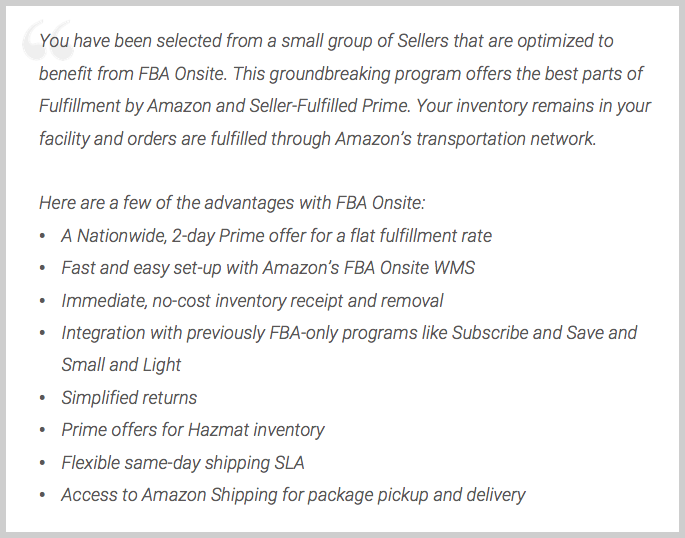 Rumored to be the most groundbreaking of Amazon’s gig services, FBA Onsite combines the best parts of FBA and Seller-Fulfilled Prime (SFP) to bring shipping rates down and to widen access to the coveted Prime badge. The program invites independent fulfillment center warehouses—mostly owned or operated by Amazon Marketplace sellers—to become nodes in the Amazon Fulfillment Network. Any Amazon orders fulfilled from these warehouses become eligible for FBA-only programs, like Prime, Subscribe and Save, and Small and Light. This program is Amazon’s latest move against warehouse congestion. By leveraging existing fulfillment center infrastructure, it relieves the burden on Amazon to build more fulfillment centers or overcrowd existing ones. The Seller’s Perspective: What Are the Benefits for Participating? One Amazon Marketplace seller cites the following advantages from an email they received about the program. He further explains the process: Amazon flies engineers to set up your warehouse and integrate its Amazon Onsite WMS (Warehouse Management System) software. Afterwards, you can simply move items into the “node” to make it available for Prime offers, as opposed to sending inbound shipments to an FBA warehouse. 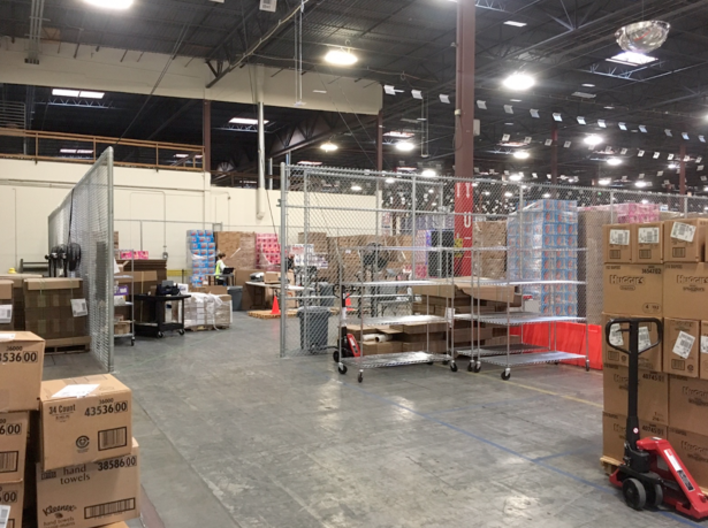 What the inside of an Amazon FBA Onsite fulfillment center looks like, according to CNBC. Image source: CNBC.com. While there are still many unknowns about the program, Amazon FBA Onsite may represent a transformational change to the Amazon Marketplace. It enables Amazon to support third-party (3P) FBA sellers with lowered costs and accelerated supply chains, while opening up space for them to build up their first-party (1P) retail business. The program is currently invitation-only, but we expect it to expand to more high-performing MFN and SFP merchants soon, falling in line with Amazon Shipping, Amazon Logistics and Delivery Service Partners as yet another gig-based sharing program.